Naval Officers Won't Face Criminal Charges In Deadly USS Fitzgerald Crash The decision ends a legal battle in which the Navy blamed Cmdr. Bryce Benson and Lt. Natalie Combs for what it called an "avoidable" accident. The move is likely to end their naval careers. The USS Fitzgerald collided with a Philippine-flagged container ship off the coast of Japan on June 17, 2017. The $1.8 billion destroyer, manned by a 300-member crew, had been steaming on a secret mission to the South China Sea when it was struck by a cargo ship more than three times its size. Seven sailors died. The decision ends a years-long legal battle in which the Navy blamed Cmdr. Bryce Benson and Lt. Natalie Combs, among others, for what it determined was an "avoidable" accident caused, in part, by numerous leadership failures. But the move is also likely to end their naval careers. A statement issued Wednesday explained that Chief of Naval Operations Adm. John Richardson recommended the negligence charges against the officers be withdrawn and dismissed. "This decision is in the best interest of the Navy, the families of the Fitzgerald Sailors, and the procedural rights of the accused officers," the statement reads. "Both officers were previously dismissed from their jobs and received non-judicial punishment." Additionally, the statement says Navy Secretary Richard V. Spencer will issue letters of censure to Benson and Combs. The letters carry no legal weight but are used within the military to publicly shame service members. "The cases are being dismissed for legal reasons that impede the continued prosecution of either officer," the Navy explained in letters sent to the families of the seven sailors who died in the collision with a cargo ship, USNI News reported. Combs' lawyer, David Sheldon, told NPR the lieutenant received a letter of censure from the secretary of the Navy on Thursday admonishing her for her actions. "To be clear, Lt. Combs was fully prepared to defend and defeat the charges brought against her," Sheldon said. "She was not responsible for setting an operational tempo that undercut staffing and training, that allowed for the ship to move with 'degraded' radar and that put sailors at extreme risk aboard the USS Fitzgerald." The USS Fitzgerald collided with a Philippine-flagged container ship off the coast of Japan on June 17, 2017. The $1.8 billion destroyer, manned by a 300-member crew, had been steaming on a secret mission to the South China Sea when it was struck by the cargo ship, more than three times its size. The resulting gash from the strike was bigger than a semitruck. Hundreds of tons of water flooded into the warship, leaving seven sailors dead in their berthing compartments. Benson was the ship's commanding officer at the time. Combs served as the tactical action officer. Two months later another destroyer — the USS John S. McCain — smashed into a Liberian-flagged tanker near Singapore, resulting in the deaths of 10 sailors. 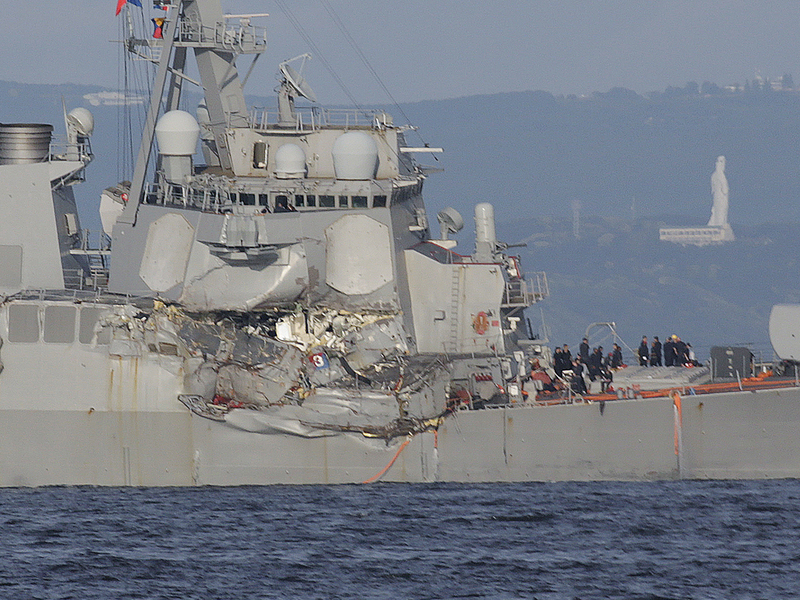 A Navy investigation of both accidents found that in the case of the Fitzgerald, "Many of the decisions made that led to this incident were the result of poor judgment and decision making of the Commanding Officer." But the report added, "The crew was unprepared for the situation in which they found themselves through a lack of preparation, ineffective command and control, and deficiencies in training and preparations for navigation." And, at a news briefing following the release of the report, Richardson told reporters that "rising pressure to meet operational demands led those in command to rationalize declining standards ... in fundamental seamanship" skills. Richardson said crew members lacked a basic understanding of how to drive the ship. They did not know "how to respond when you get into a crossing situation" or "the basics of understanding the ship control console," he said. He also acknowledged that fatigue and sleep deprivation played a role in the deadly incident. The findings of the investigation ultimately led to an overhaul of the Navy's training, scheduling, policies managing fatigue and operational safety procedures. "The comprehensive program to improve Navy readiness and training, to do everything possible to ensure that accidents like this will not recur, remains on track," the Navy said on Thursday.